On entering the building, the visitor finds himself in a long, low hall, with oak beams across the ceiling. It is lighted at each end by long latticed windows containing many pieces of colourful stained glass. The windows on the north side contain four pieces of old German glass representing scriptural subjects. In the centre of these are two historic portraits, one of which is a lady in a 16th century costume. This was Catherine, wife of Henry Bradshawe II and the mother of Judge John Bradshawe. The other, it is said, is the poet John Milton who was thought to be a cousin to the Judge and was Cromwell's Latin secretary during the civil wars. Priceless relics lie in the entrance hall to Marple Hall. The floor is paved with large flags, inlaid with black marble tiles at each corner. The combination of which makes a very imposing pattern. 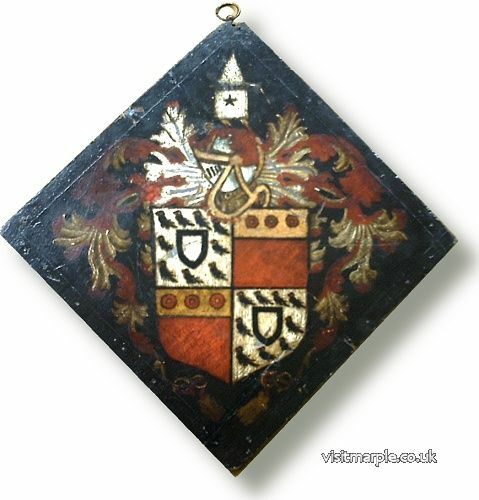 Over the fireplace, which is original, is a crest which once adorned the old Grammar School in Marple, which was endowed by Judge Bradshawe. 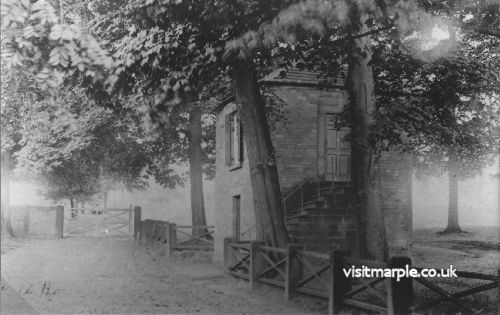 It was pulled down in 1840 and the Marple Conservative Club built on its site. In the hall is a quantity of armour, probably household armour from the reign of Henry VII. One helmet from the time of Charles I has been smashed by a bullet. This is said to have been worn by Colonel Bradshawe at the battle of Worcester, when he was wounded. There is a fine two-handed sword which is Swiss and probably also of the reign of Henry VII. There is one exactly similar in the Tower of London. The two spears with fine heads and poles covered with velvet, are like those in the Armoury of the Tower of London, to which are assigned the date of 1480. 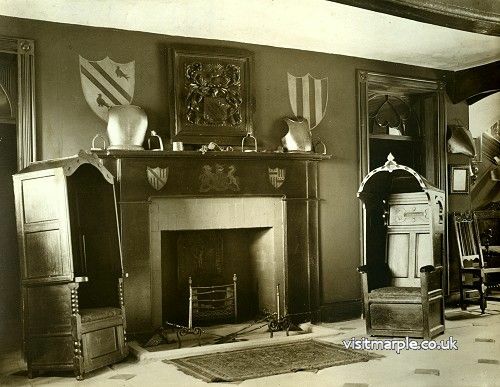 The fireplace and amazing chairs in the entrance hall of Marple Hall in 1919. The oak furniture is of different dates, one settee bears the date 1598. Two curious hooded chairs and the finely carved clock are probably late 17th century. The black Jack, or leather bottle is a relic of the Stuart times. The first door on the left leads to a room which was the library. This is lighted by two long lattice windows similar to those in the hall. The deep window seats and the canopy above are hand carved and contain the arms of families allied with the Bradshawes through marriage. The magnificent bookcase contains an exquisite dinner service of Chamberlain Worcester china. There is a superb collection of furniture in this room, mainly of Jacobean date. This room at one time contained one of the finest collections of old English literature. These belonged to the Judge and were sold in 1792. On the left as one enters is a sideboard with cupboards on either side, which are probably Flemish, early 18th century. They are very delicately carved and inlaid with ebony. Most of the furniture is of Jacobean date. There is a very elegant Lancashire chest of drawers, or dresser and a finely carved brass bound chest. On the wall opposite the fireplace hangs a large piece of Flemish tapestry, this with an intact border surrounding it of flowers, contains a scene representing the different processes of wine making. This tapestry is probably 17th century. 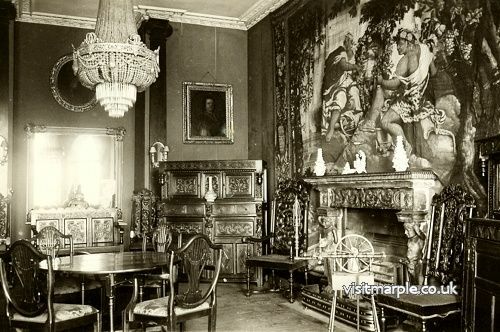 The pictures in this room are, to the left of the sideboard, Henry Bradshawe IV, of Marple and to the right his wife Elizabeth, the lady three-quarter length in black. Over the fireplace is a portrait of Sir John and Lady Done. Another shows Sir John Crewe, founder of Lord Crewe's family. The principal staircase leads from the entrance hall, it has heavy balustrades adorned with richly carved vases of fruit and flowers. It was constructed when the height of the drawing room was altered by John Bradshawe-Isherwood I at the beginning of the 19th century. On the walls hang many pictures. The suit of mail armour on the first landing is probably of the reign of Edward III. The piece of tapestry without a border is Flemish 18th century and represents Harvest. At the first landing a long dark corridor runs the length of the building and leads to a number of different rooms. The staircase is surmounted by a demi-dome from which, through folded doors, one enters the drawing room. On the first floor to the left is the Bradshawe room, a small bedroom reputed to be the birthplace of Judge Bradshawe in 1602. 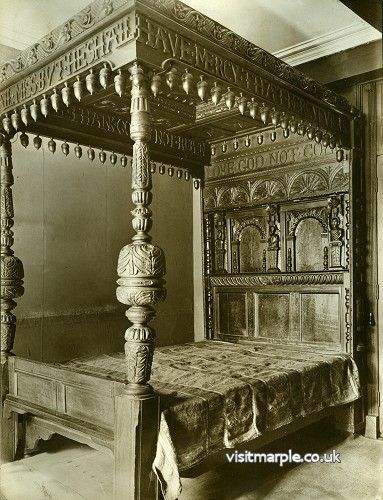 This room contains a magnificent oak bed which is richly carved with mottoes, on the outside, " He that is unmerciful, mercy shall miss: but he shall have mercy that merciful is." On the inside, "Sleep not until U consider how U have spent the time: if well, thank God; if not, repent." and above the head, "Love God, not gold." The window is latticed and contains small panes of stained glass, and on the window is engraved the words: "My brother Henry must heir the land, My brother Frank must be at his command, While I, poor Jack shall do that which all the world will wonder at." These lines are said to have first been scribbled by Judge Bradshawe on a tombstone in the Churchyard at Macclesfield, when he was being educated at the Grammar School. Above the window is a canopy similar to the one in the library. Let into this is a fine piece of gilded wood carving representing two fat cherubs supporting a frame in which St. Francis is seen receiving the stigmata from the Crucified in the form of a seraph. This is Dutch work, late 17th century. On the mantle piece is the arms of the Judge quartered with those of his wife, Mary Marbury of Marbury. Further along the corridor are the Ante-rooms. On entering these the visitor is immediately impressed by the wonderful old oak panelling, which is adorned by a gilt frieze of a dragon pattern. Over the fireplace is the family crest of the Bradshawes, elaborately carved in wood, the date 1665 being cleverly worked in each corner, amidst twisted cords and knots. To the left is a door, over which is a wooden grill. This is an old dressing room, where travellers in the olden days would change their riding clothes. These were hung on the hand made hooks in the panels, where the water and mud dropped onto the floor and down a curious little drain. 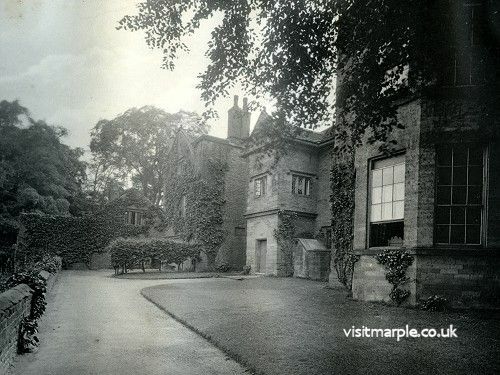 A visit to Marple Hall in those days would be very much in the nature of an adventure, apart from the hardships of fording rivers and travelling through woodland. From here leads the Grey room, where is kept a copy of the warrant to execute King Charles. Here also is to be seen an old engraved plan of Naseby, the crowning defeat of the Royalists. At the end of the corridor the visitor enters a room which Cromwell is believed to have occupied during his visit to Marple. A local tradition which has been handed down to our time, is that when the Protector was leaving Marple Hall, he was thrown from his horse into a deep ravine which crosses the road running through the estate from Marple to Chadkirk. It is known to this day as "Oliver's Gig." 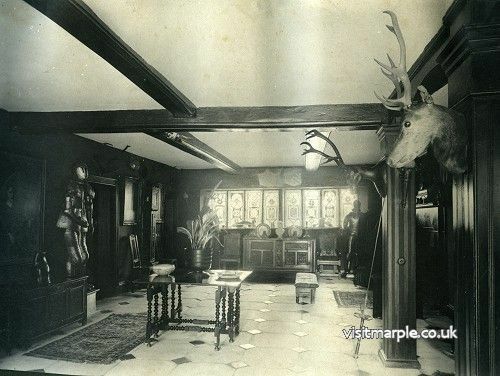 A black and white half timbered gable can be seen in this room, which formed part of the earlier house built by the Vernons, in the time of Henry VII. Retracing our steps back to the staircase and making our way to the next level, we reach a large room lighted by bay windows, which were put in over 100 years ago. Through these windows, which overlook the terrace, a view of splendour unfolds. The Dining RoomThe vale forms a great natural amphitheatre and is surrounded by dense woodlands of oak, ash, elm and beech. The hills of Werneth Low form the northern backdrop, whilst the mighty head of the Peak can be seen in the distant west. Over the terrace is a sheer drop of two hundred and fifty feet into the vale. A careful observer will be able to trace the old river banks. Over a hundred years ago a large sheet of water stretched from the bottom of the cliff to the woods which can be seen in the distance. This formed a pool in the natural course of the river Goyt and was known as Mere Pool, from which the village of Marple owes its name. 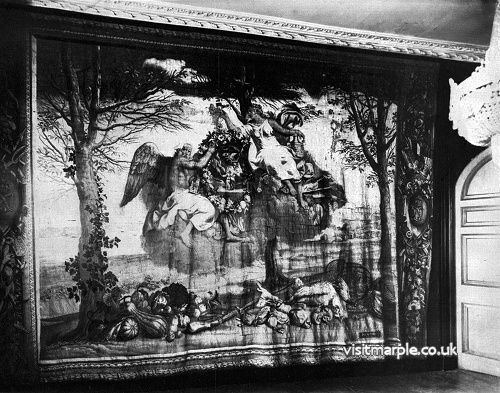 On the principal walls of the Drawing room hang two large pieces of Gobelin tapestry. The design of the piece over the fireplace represent the goddess Diana, with weapons of the chase and the god Bacchus surrounded by a vine tree and fruit, holding up a wreath of roses, lilies and other flowers. Louis XIV is also depicted on horseback hunting a stag with hounds. The piece on the opposite wall is of similar size. It depicts a stony and desolate background, with a river and a deserted chateau, in the foreground is a design of vegetables and dead game. At the centre, in clouds, are the goddess of pleasure holding a wine cup and a winged Father Time with a goblet and wine cup overturned at his feet. The fireplace is of red Veronese marble and came from the Palazzo Conto at Padua, and bears the crest of that family. 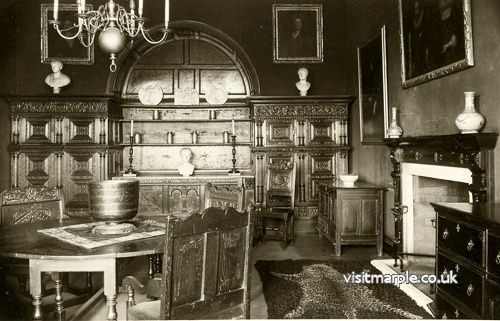 The two court cupboards are 17th century and are very finely carved. There are also five high backed Carolian chairs of pear wood with intricate carving. These belong to the reign of William and Mary. An exquisite George IV cut glass chandelier hangs from the ceiling and the suite of chairs down the centre of the room are Hepplewhites'. Making our way to the top of the building, on the main staircase again we pass a number of portraits, including Elizabeth Brabin, wife of Nathaniel Bradshawe-Isherwood II. At the top of the house is a room leading to the roof. Below is a curious passage, or chamber, which is believed to have been used as a priests hiding place in the time of the earlier house. During some repairs made at the beginning of the 19th century, two skeletons were found here, the origin of which are unknown. From this chamber a shaft, opening direct to the bottom of the cellars, is thought to have at one time been a means of entrance to the chamber. The other rooms on this level are of very little interest, although in two of the upper bedrooms are curious canopies of stone and the remains of a niche for a statue. 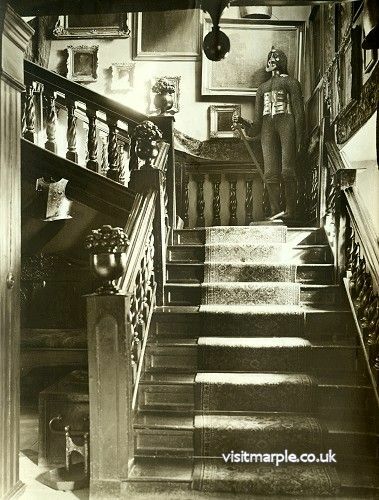 It is possible to make our way to the ground floor again by a narrow winding staircase and along a short dark passage to the Old Dining room. This is dimly lighted by a small oblong window. 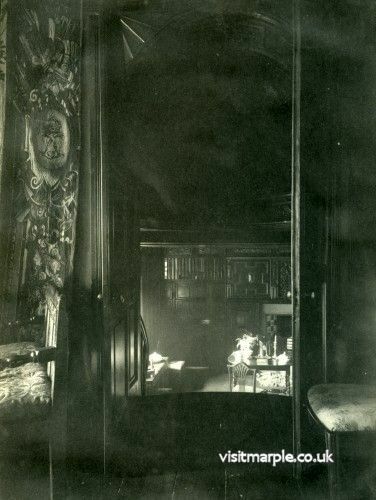 In the days when the Vernons and Stanleys were in residence it was the dining room. Unfortunately the panels have been painted, it is believed to have been first done at the time of Cromwell's visit. Fastened on the panels on the left of the fireplace are two old muzzle loading gun racks. It was necessary in those days to keep loaded guns near the fire in order to prevent the damp atmosphere effecting the powder. The visitors are now conducted to the terrace, where they take leave of their guide and are free to view the external buildings, from the outside only. It is believed that these and the great barn were built for the purpose of housing Colonel Bradshawe's roundhead troopers, although the date 1669 seems to dispel this and makes it appear that they were built in more peaceful times. The writer however (H.Cotton) firmly believed that the upper portion was an addition to the lower part, the date concerned being the time when the addition was made. Like the hall, it is built of red sandstone, with the exception of the clock tower which is built of brick. This is because the supports were not strong enough to carry what would have been a very heavy load in stone. The clock in the tower bears the date 1685. This is the small square building situated outside the precourt. Its position commands both drives and protects the water supply to the hall. The water is brought here from two parts of the park and is stored in a large leaden cistern in the lower part, where it is siphoned to the hall. It is interesting to know that the supply has never been known to fail, even in the most serious drought. The water is rich with mineral salts. Time changes all things, and we must always change with them. 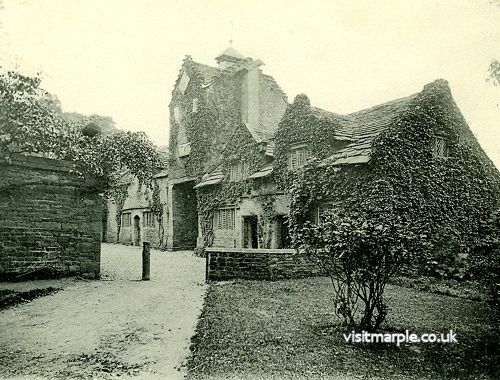 Yet, one can hardly look back on the old grey walls of Marple Hall, without a mingled feeling of sadness, when it is remembered that hundreds of years have passed since the close of those sterling days. Like a play that has ended, the hall is the stage; now deserted and silent. Now, as then, the bell in the old clock tower still strikes out the hour at midnight and its soft mellow tone ringing through the woods and valleys, tells the passing of another day. As the bell ceases to resound and stillness reigns again, a faint echo of the last stroke can be heard from across the dale, as if in answer from the long dim past: and who shall blame the spirits of the departed if they, at the solemn hour when night and morning meet, revisit their old haunts in the lower world, which was once their home. The stern old Puritan Colonel and the grim visage of the Lord President.